Houston, we have a date! 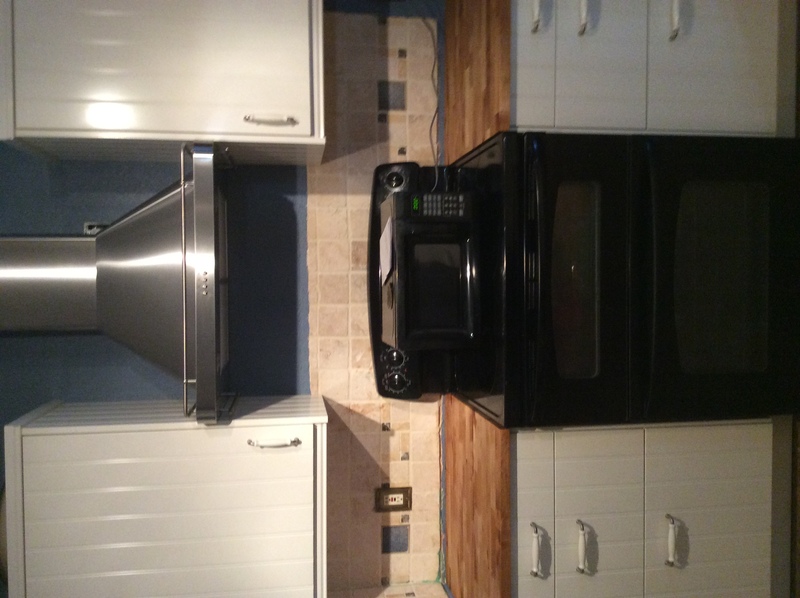 The cabinets will be installed Feb. 1 and 2. Let me repeat that: I should have a fully functional kitchen Feb.2!!!!!!!!!!! I need to take photos.....and get them posted. Right now, though, I want to happy dance all over the empty house. Sunday, most of the kids bathroom was textured, but not all. Football was on, so nothing else got accomplished by the male portion of the equation, but I painted what I could. Monday - SG woke up "sick". You have to understand, when he gets sick, he's the sickest sick person to ever be sick. :sigh: He managed to play some TitanFall finish the texturing in the bathroom, but it was too late for me to be able to finish the painting. Tuesday: SG still sick. Himself and I ran Herself to FIL's, then headed home so Himself could tear out the kitchen cabinets. got home to find that SG was able to pull the doors off, but was "too sick" for us to do any tear out. I did all the sponge-painting in the kids bathroom - the painting in there is now DONE. Tuesday, Evening/Wednesday: I went to bed at 9 - late for *me*. At 11:30, the phone rang - Herself was in the midst of a panic attack. I talked her down, went to the bathroom, and she called back - it was back, only *worse*. At 12:40 I headed out to Ft. Worth; we got home at 3 AM. (I was able to get her into the Doctor's today at 1:30....I know it's her thyroid; she has all the symptoms of Hashimoto's, but her labs come back "normal". When I asked if maybe "normal" is *high* for her, we were told that maybe she could try yoga. :bangs head: Anyway. I couldn't get back to sleep, so went into a rather manic phase - the kitchen cabinets are now *gone* and the kitchen has been completely repainted. It's now a nice, baby French/Country blue instead of Olive green. Today: Doc appt at 1:30. The flooring is due to be delivered this morning. Himself/I need to paint the Family room and do some touch ups, and to move out most of the stuff that we moved back in so we could live a little more comfortably. IF the doctor's appointment goes well, tomorrow I'll take Herself back to Ft. Worth. Honestly - she doesn't need to be here while all the work is being done - it'd really mess her up. Change always does. IF SG can get the Hardie board up in the kids' bath, Himself and I can start the tile work. SG needs to focus on the kitchen, though - he STILL hasn't finished moving the bar wall. :bangs head: (He got very upset with me Tuesday AM when I told him that we didn't have the TIME to be sick. It's just a cold, for pete's sake - he's not dying, he's not incapacitated! In revenge, he passed his cold to the rest of us....and lo and behold, it hasn't stopped us. I was still able to run and pick up the paint yesterday, and to actually paint with it......he's upset about THAT, as well. :shrug: There's too much to do and a finite amount of time to do it in - I can't afford to take any time off just because I have a cold. :sigh:) (This is why I couldn't go to sleep yesterday, even though I was totally exhausted - too much HAS to be done before the floors go in. Ah, well - such is life here, right now. I can tile even after the floors go in, if necessary - don't want to, but hey - the tub will catch most of the mess. And! Once the floors are in (next week, they said!!!! 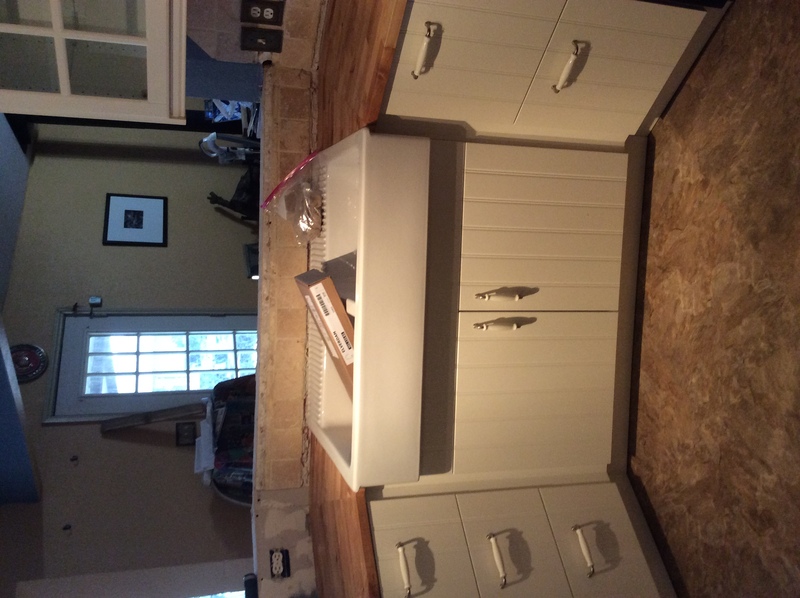 ), I can go order my cabinets (we're waiting on SG's severance package; had we gone with lower-quality floors and bottom cabinets only we could have already ordered everything. BUT...we didn't. And SG only got 1 week of vacation pay....and was freaking out over how we'd survive. :shakes head: So.....soon as his severance hits (next week - funny how it all worked out, huh? :wink:) we'll go to Ikea and get that ball rolling. :rubs hands:) Things are looking up! Things are starting to pop! Yesterday was a busy day! We went to the floor store and put the deposit down on the floors! :huzzah! : We're looking at the 2nd week of January, more or less...which is good. The wood stove can't be moved until 1/6, and it has to be out before the floor can go in the family room. Once you've decided that you want to go with Ikea, I HIGHLY recommend you plunk down the $249 for the planning service (vs. the $149 for the measuring service, or $0 to do it yourself. Just...trust me on this!) However, BEFORE you go in (and...do go in, even if it's a bit of a trip. Again, trust me - and find something else to buy so it's not a "wasted" trip. ), go thru and kind of decide the "look" you want. Why? Because they require a basic idea before scheduling your appointment. I had already decided I wanted the 'Hittorp' doors, drawers on the bottom and glass - if possible! - on top. I also knew I wanted the Butcherblock countertop - the solid wood one, not the veneered one (because SG is going to router a nice edge on it. :grin:) So. We went in the moment they opened the doors and headed straight for the kitchen department (do this. Again - trust me. Ikea is usually crowded, and it seems that most people want to browse the kitchen department.) The salesman had me fill out a pre-planning guide (see why I told you to KNOW what you think you want? 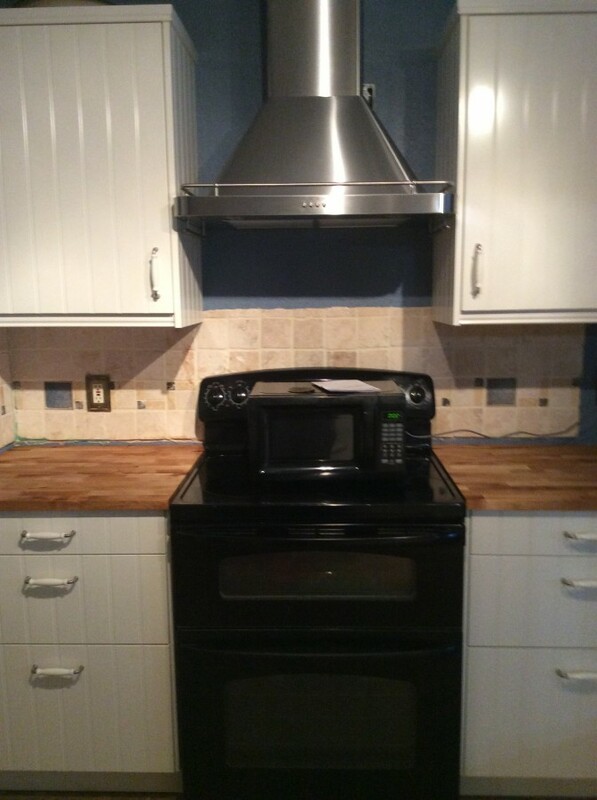 :lol:); I had to indicate that I had appliances already and wasn't going to replace them (and guess at the sizes of said appliances), and that I was using one of their countertops (some people go elsewhere). Then he rang me up, and told me that when I actually ordered the cabinets I'd get the $249 back as a gift card (I knew this, but wanted to put it out there anyway. Basically, the service is free if you do go thru with the order.) Also, IF I bought the cabinets and they went on sale within 90 days, because I was an Ikea Family member (If you're going to buy a lot from Ikea, JOIN. It's free) I'd get the difference back as a gift card. If you're not a Family member, you're kind of out of luck on that one. Anyway. The appointments are for a 4-hour visit. That sounds like more than enough time...it was barely enough. Granted, our kitchen is.....interesting. 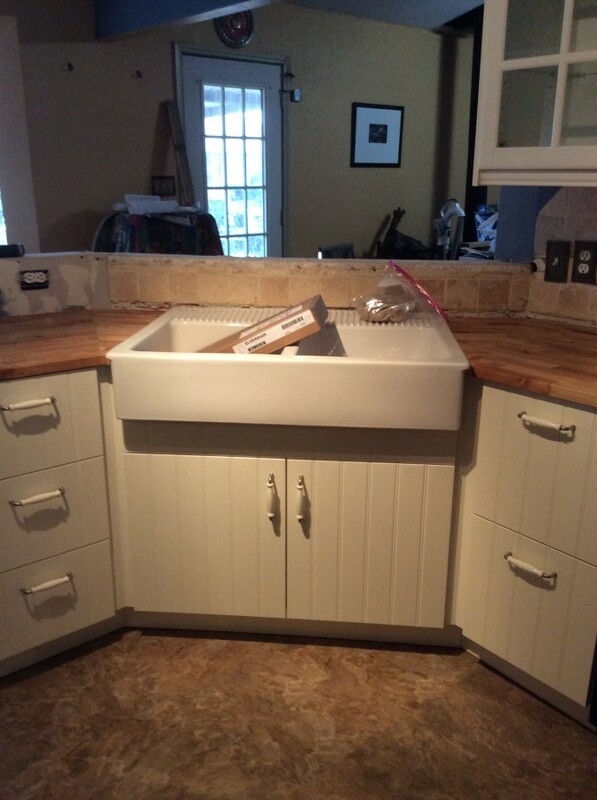 We only have 2 walls for cabinets; the sink is angled away from the dishwasher wall at a 60-ish* angle, with another 60-ish* angled cabinet ending that run. 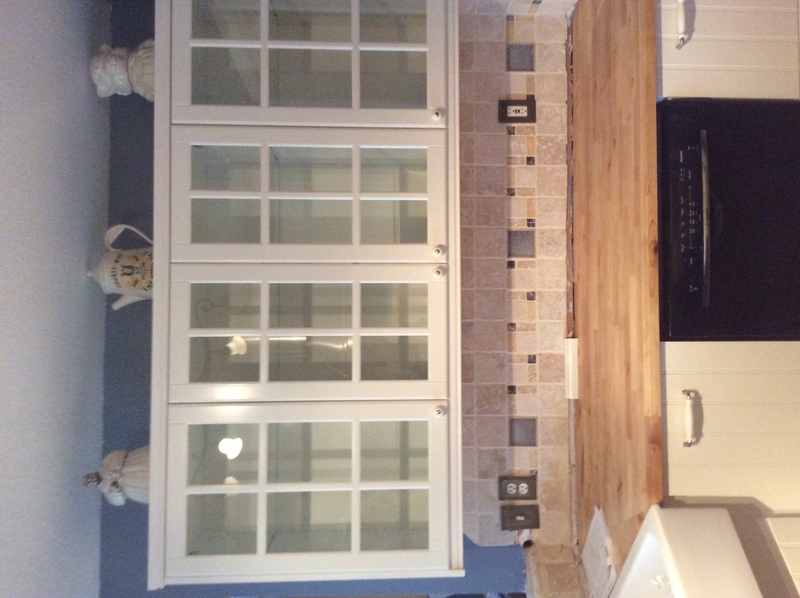 Plus there's a narrow bar along that run of cabinets. The other side has the range, with a microwave/hood and refrigerator. 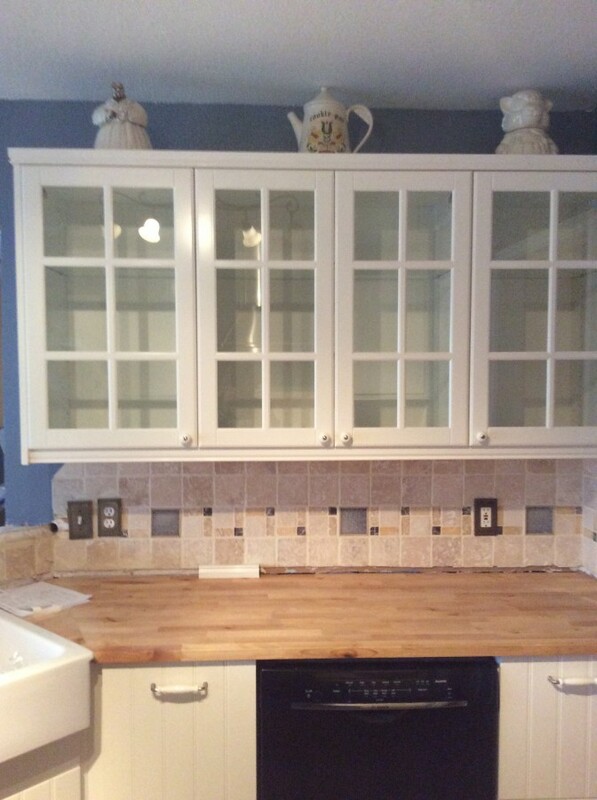 We have more bottom/base cabinets than we do wall cabinets. It's not a huge kitchen, but that angled bit made things......interesting. The sink-side of the kitchen will have 6-pane glass doors on top; 2 narrow cabinets on each end with a 30" wide double-door cabinet in the middle. We're gaining approximately 6" of cabinet length here, and losing the sorta stupid-looking blank space at the end of that run. The dishwasher will need to be scooted over a little bit, so that we have 2 identical cabinets with drawers on either side of it (right now, we have 1 wide cabinet next to the wall, and 1 narrow cabinet near the sink....it's unbalanced and has bothered SG. Me? Not so much, but it's a minor thing.) ALL the lowers are drawers; all of them (I think) have a hidden small drawer on the top (think silverware drawer.) From the front, you'll see 2 or 3 drawers, but inside there's a +1. It does not include installation. The planner said to estimate $65/cabinet...which sounds awfully low to me (Ikea had said $200/cabinet, which sounds WAY too high.) IF the $65 is correct.........installation would run about $1,000 (OK, less, but I'm trying to round up and include any taxes.) IF this is correct we are going to have them do the install - the planner said it would take maybe 1 day to do. (Versus the 10+ days I've seen DIY'ers take. Um....I'll take 1 day for $1,000, Alex!) If it's more, we'll have to discuss it and decide then. Houston, we are go for Remodeling! I'll soon have my house back! Can't wait!!! !